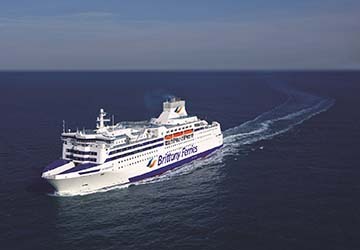 Commissioned by Brittany Ferries in 1991, the Normandie is named after the French region of the same name and decorated in traditional Norman style and colors, and features first-rate on-board facilities including excellent dining, shopping and live entertainment. 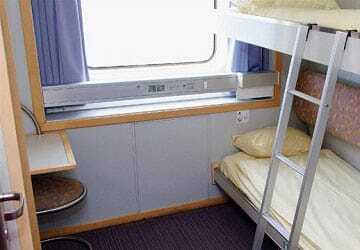 The Normandie offers passengers a choice of over 200 cabins all of which are en-suite and air conditioned. Soap and shower gel are also provided in case you want to freshen up and you'll also find at least 1 plug socket to use or to charge any electrical appliances that you may have. 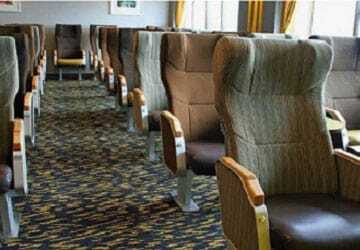 Reclining seats provide a great value option for overnight crossings and additional comfort to your day sailing. The reserved seating lounges are located towards the front of Normandie on deck 7 and all lounges have large windows offering panoramic views. 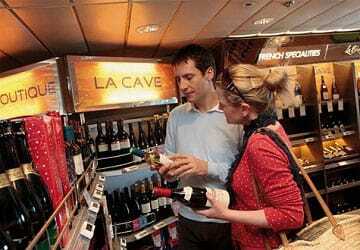 There's plenty of choice for eating and drinking onboard including the main restaurant - Le Deauville Restaurant & Bar, a self service restaurant - Riva Bella a Coffee shop - Le Pays d'Auge Café and Le Derby Bar. The boutiques are on decks 7 and 9 and offer a fine range of spirits, wine, tobacco, perfumes & cosmetics, leather goods, confectionery, toys, fashion, decoration, souvenirs, newspapers, games, cameras, sunglasses, jewellery. Normandie features plenty of deck space so you can stretch your legs and and enjoy a calm spot to relax, while enjoying the sea air and incredible views, particularly when entering or leaving the port. Sun decks are on decks 8 and 9. There's also Wi-Fi internet access (not free), a baggage room to leave your luggage, a Bureau de Change, baby changing facilities, games room, video games room and slot machines, seasonal Caberet (DJ, Magician, Live Band) and 2 cinemas. Young children can enjoy fun and games in the playroom on deck 9 or during the peak season they can take part in the special entertainments programme and enjoy everything from games to treasure hunts. 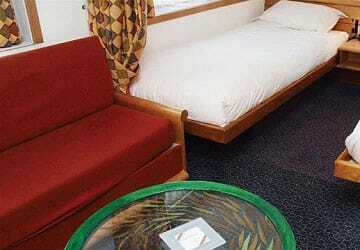 The ship is wheelchair friendly with specially adapted wheelchair accessible cabins. Disabled toilets are located on deck 7, 8, and 9 and all decks can be accessed by elevator. Please Note: Whilst we have taken great care in making our Normandie guide as accurate as possible, onboard facilities, services and entertainment may vary depending on the date and time of year that you travel, facilities mentioned may change without notification and ferry companies reserve the right to operate vessels other than those mentioned at time of booking without prior notification. Travelling from Portsmouth to Caen and back two weeks later on the Normanday proved to be an enjoyable experience with good cabin space, good food in the Self Serve facility and a very relaxed transition from England to France and back. "What a great way to cross the English Channel"
On my very first trip to Europe I spent some time in London and then ventured over to France by way of ferry. 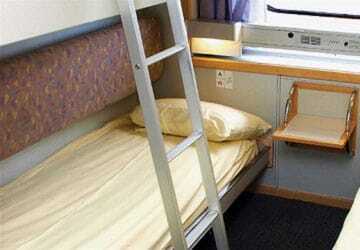 The journey was to be several hours so I booked a cabin. 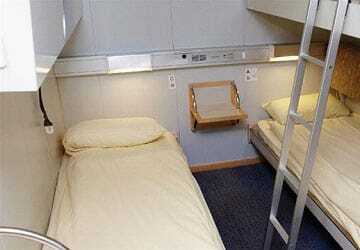 I purchased a snack and a glass of wine once on board and returned to my cabin to eat and rest. The journey was smooth and having the opportunity to eat and rest while the time passed worked very well for me. Portsmouth is a good location for us living in the midlands & Caen gets you to a good point in France to head on south. This service avoids going near Calais & getting into 'trouble'! We had a day cabin this trip which proved very nice & useful, as we were very tired. "Last Minute Booking - Thank you!" After a solo cycling/camping trip came to a premature end due to injury, I desperately wanted to get home. 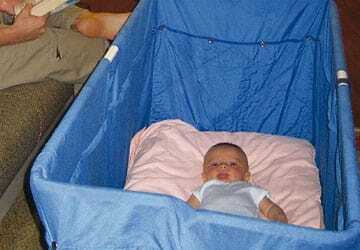 The ferry booking online was a simple-stepped process and when I arrived the 'waiting facilities' were welcomed. The staff at the port and the boarding staff were most helpful -my bicycle and panniers were secured in the hold, with the staff assuring me they would be safe - and they were!. The food onboard was fresh, reasonably priced and tasted wonderful. My cool, clean cabin was a like luxury after a weeks camping. Again breakfast was fresh and reasonably priced. Thank you for a first class service from Caen to Portsmouth - I'll be back. 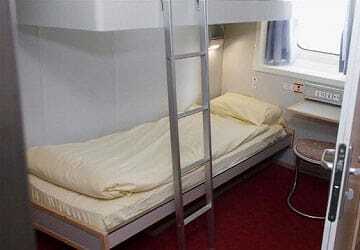 Having spent a lot of time on Dover/Calais and Dublin/Holyhead ferries I can confidently say that these ferries were head and shoulders above them in terms of facilities, room on board, food and general cleanliness. Very pleased we pucked this route for our holiday in France and do our best to avoid the horrorshow of Dover/Calais in future!